Plug in your USB drive or memory card. 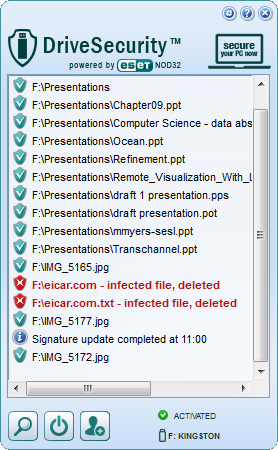 If an AutoPlay dialog appears select Open folder to view files. Double click DriveSecurity (one time only, after that it will start automatically). If the icon doesn’t appear in the Windows notification area (system tray) then double-click DriveSecurity.exe on the drive. DriveSecurity application starts. You can open the DriveSecurity window by clicking the icon in the notification area. After it is open, you can bring the DriveSecurity window to foreground by clicking the DriveSecurity icon in the notification area.